Lourdes, France is a bustling Pyrenean town, best known for famous Virgin Mary sightings, a phenomenon that is central to several other great cities and attractions. Lourdes is the second most popular tourism city in all of France, attracting over seven million pilgrims annually from throughout the globe to the cave where a peasant girl had several Virgin Mary sightings. Although Lourdes' spiritual atmosphere is tainted by numerous shops selling tacky religious trinkets (think framed, velvet Jesus art and pink plastic rosaries), even an atheist could appreciate the splendor of the enormous Basilica of the Rosary. It was built in response to the hordes that began to descend on the city after the Virgin Mary sightings, and is an amazing example of architecture. The city is also in a prime location. The Pyrenees are steps away to the south, and Spain is close by. It is the perfect destination for the adventure traveler, with numerous outdoor activities like skiing, hiking, mountain biking, kayaking and more close by. The Pyrenean cities of Pau and Tarbes are a few minutes away. The charming small spa village of Argeles-Gazost is about a 15-minute drive away, and it also features a casino. 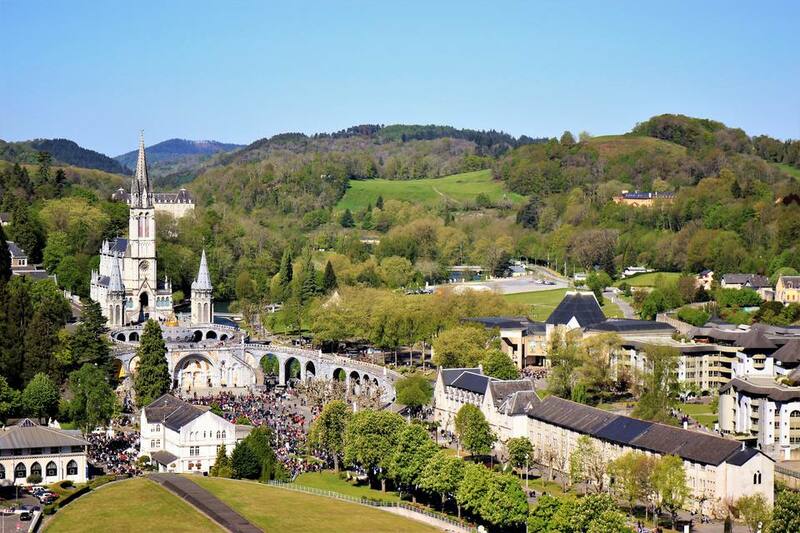 In 1858, Lourdes went from being a small village in the Pyrenees to a global attraction. This was when the peasant girl, Bernadette Soubirous, had a life-altering visit to a cave with her siblings to gather wood. According to accounts, "Lifting her head, she saw, in the crevice of the rock, a young girl, surrounded by light, who looked at her and smiled." This was the first of eighteen visions Bernadette claims to have had of the Virgin Mary. Bernadette eventually became a nun in Nevers. Today, the cave is just at the base of the basilica. Streams of believers, many in wheelchairs or even rolled in on gurneys, swarm the cave where Bernadette had her visions for a taste of the water from the spring there and with hopes for a miracle. The primary Lourdes attractions are the cave where the sightings occured and the Basilica of the Rosary built to watch over it. It is free to enter, and it is a must-see. This Romanesque style cathedral is one of the largest in all the world. Scale the massive winding ramp to the basilica, turn around and look straight ahead and you will see it: Lourdes' castle and Pyrenean Museum. If it weren't overshadowed by the basicila and the Virgin Mary sightings, this would surely be the city's top attraction. Although it dates back to Roman times, very little remains from that era. Primarily, it is a fascinating gothic fortified chateau. It also is home to a wonderful museum detailing life in the Pyrenees. The House of Bernadette Soubirous' parents features a mill, kitchen, Bernadette's bedroom, photographs and other memorabilia of the childhood life of Lourdes most famous daughter. One way or another, if you are coming from the U.S., you will need to pass through Paris en route to Lourdes. There are connecting flights through Paris to the Tarbes-Lourdes-Pyrenees International Airport. You can also fly into Paris, and then use a France Rail Pass to reach Lourdes or visit any number of other destinations during your visit. There are a dizzying number of lodging options for such a small town, but you can use that to your advantage. You can camp for a few euros or stay in four-star accommodations for big money. The Best Western Hotel Christina is blessed with a fabulous location a short walk to the sanctuary and grotto, as well as the train station. If you like more attention to detail and finely appointed rooms, the Grand Hotel Belfry, at the foot of Lourdes' chateau, is a good choice. Argeles-Gazost, just a few minutes from Lourdes. This is a charming small village with a quaint street lined with boutiques and cafes, as well as a casino and thermal spa. Pau, about a 45-minute drive away. This is a fascinating Pyrenees foothill city, birthplace of King Henry IV. To this day, you can visit Pau Chateau, where he was born, and the famous tortoise-shell cradle he slept in. Tarbes, a 20-minute drive from Lourdes. This city is suprisingly large considering its rural Pyrenees location. Zaragoza, about a four-hour drive from Lourdes. Although it's a bit of a stretch to call this a day-trip (it would be one long day), there was also a Virgin Mary sighting here that pre-dates the Lourdes sightings by centuries. This is another popular pilgrimage city.